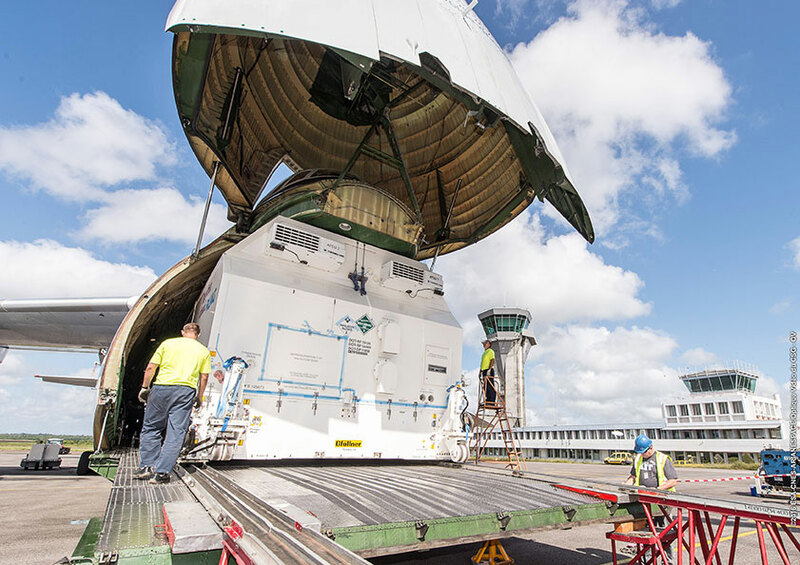 The second Sky Muster™ satellite to be orbited by Arianespace for Australia’s nbn™ arrived in French Guiana this week, taking one of the world’s largest communications platforms one step closer to its October launch aboard a heavy-lift Ariane 5. Enclosed in its protective shipping container, Sky Muster™ II is unloaded from the chartered An-124 cargo jetliner at Félix Eboué Airport following the satellite’s arrival in French Guiana. Weighing in at 6,400 kg. for liftoff, Sky Muster II will provide additional data capacity to support nbn’s delivery of satellite broadband service – helping bridge Australia’s digital divide for some 400,000 homes and businesses in regional and remote areas of the country. Sky Muster II was delivered by a chartered Antonov An-124 cargo jetliner, which touched down yesterday at Félix Eboué Airport near the French Guiana capital city of Cayenne. After unloading in its protective shipping container, the satellite was ready for a road trip to the Spaceport launch base. 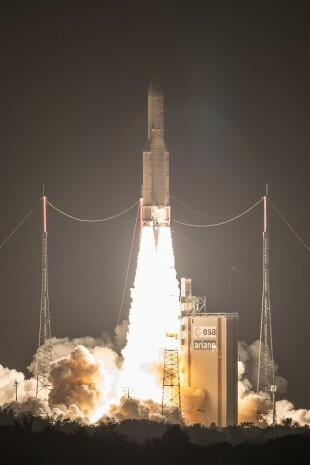 The October 4 mission – designated Flight VA231 in Arianespace’s launcher family numbering system – follows the company’s lofting of nbn’s first Sky Muster relay platform in September 2015, using another Ariane 5. As with last year’s launch, the Ariane 5’s protective payload fairing for Flight VA231 will be decorated with artwork related to the nbn network that will enable communities across Australia to access fast broadband, with the goal of connecting eight million homes and businesses by 2020. The artwork is a mosaic-style image composed of more than 700 Australians who won nbn’s “Blast Your Face Into Space” competition for the opportunity to include their picture on Arianespace’s workhorse launch vehicle. On the Ariane 5 used last September with the original Sky Muster satellite, its payload fairing included a drawing from six-year-old student Bailey Brooks, whose school won a contest to name the satellite, submitting “Sky Muster” as the suggestion. Joining Sky Muster II for Arianespace’s Flight VA231 in October will be India’s GSAT-18 telecommunications satellite, developed by the Indian Space Research Organisation (ISRO). GSAT-18 will have a liftoff mass in the 3,400-kg. category.